Could Geneva IV Become as Effective as Astana? Submitted to The Rabbit Hole for publishing by Firas Samuri with Inside Syria Media Center. The next round of the Syrian talks under the auspices of the United Nations between the Syrian government and the opposition will take place in Geneva from May 16-19. During the upcoming meeting, the UN Special Envoy for Syria Staffan de Mistura expects to conduct intensive work with both delegations. But could the talks in Geneva become as effective as Astana? Commenting on the format of meeting de Mistura noted that it would be held in the same format, with his direct involvement. He believes that in this way it will be possible to achieve greater success rather than in a general meeting. Within this framework, Syrian President Bashar Assad is skeptical about the prospects of Geneva talks and considers them ineffective. Assad also mentioned that talks in Geneva were formal and the diplomats were not able to achieve any positive results. According to Assad, the main purpose of the Geneva talks was to force the Syrian government to make concessions that in fact had contradicted the Syrian constitution, national interests, and territorial integrity. Despite these facts, a number of Syrian analysts continue to believe that the Special Envoy could actually activate the negotiation process between the conflict sides, which would lead to significant success. For instance, the signing of the document on creating the constitutional commission of Syria may become a positive outcome. 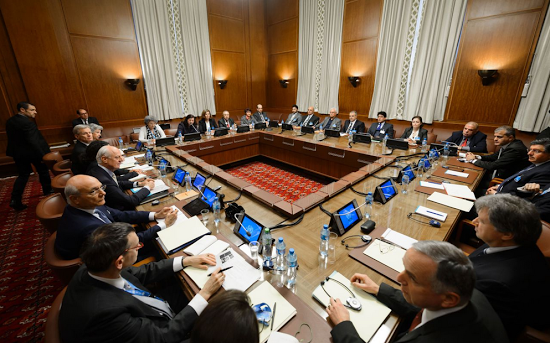 It should be mentioned, the leader of the Astana political platform of the Syrian opposition, Randa Kassis seeks to involve the UN Security Council members in a discussion on constitutional changes in Syria. Thus, she showed the interest of a separate part of the opposition on this issue. The Syrians hope that within the frameworks of the upcoming round of talks in Geneva the Syrian opposition will be ready for full-fledged dialogue with the authorities of Syria instead of making empty promises. As through the political dialogue between the parties rather than continuous battles is possible to establish peace throughout Syria. Article has not been edited by The Rabbit Hole.